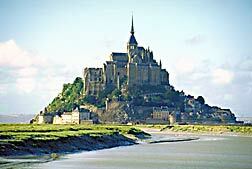 Mont-Saint-Michel is a 1-ha (3-acre) rocky islet topped by a famous Gothic abbey, 1.6 km (1 mi) off the coast of Normandy in northwest France in the Bay of Mont-Saint-Michel in the English Channel. The island, located 5 km (3 mi) from the shore during the Middle Ages, is now surrounded by water only two times a month. Its one cobblestone street climbs in three spirals from a great granite base to the towering Benedictine abbey of Mont-Saint-Michel, an architectural masterpiece built in the 13th century, replacing the original abbey, which was founded in 708 by Saint Aubert, bishop of Avranches, but destroyed by King Philip II of France in 1203. On the other side of the English Channel, off the coast of Cornwall, in England, is Saint Michael's Mount, the site of a priory (later a castle) that belonged to the Mont-Saint-Michel abbey in the Middle Ages. Sources: 2001 Grolier Multimedia Encyclopedia, © 2000 Grolier Interactive Inc. Le Mont-Saint-Michel, a series of informative pages hosted by Ouest-France. Abbaye du Mont-Saint-Michel, a virtual tour hosted by Centre des Monuments Nationaux. Relevant publications: Henry Adams, Mont-Saint-Michel and Chartres (1986). Roger Vercel, Tides of Mont St-Michel (1971). Thierry Hatot and Anne-Marie Piaulet, Mont-Saint-Michel: Scale Architectual Paper Model. Images: Mont-Saint-Michel, viewed from 1 km, from Ministère des Affaires Etrangères, copyright F. de La Mure / M.A.E.  All Rights Reserved. Mailing address: B.P. 22, 50116 Le Mont-Saint-Michel. Phone: 02-33-89-80-00. Fax: 02-33-70-83-08. E-mail: hochet@monuments-france.fr. Education department: Annick Fillatre 02-33-89-80-19. Abbey hours: May 2 to August 30: 9 a.m. - 7 p.m. (last admission at 6 p.m.). October 1 to April 30: 9:30 a.m. - 6 p.m. (last admission at 5 p.m.). Closed on January 1, May 1 and December 25. Tours & Admission: Various rates for adults, reduced-rate admission, groups, and students  based on whether visit is unaccompanied, led by a guide, or with audio commentary provided. Please refer to web site for list of rates. Access by car: From Saint-Malo  exit n° 2, secondary roads D 155 and D 797 towards Pontorson, then secondary road D 976. From Caen  exit n° 8, main road N 175 towards Rennes, up to Pontaubault, then secondary roads D 43, D 75 and D 275 to the Mont Saint-Michel.